It’s a pretty sad reality, but we have to face the facts: no one older than seven can do mental math anymore. That’s what calculators were invented for, silly! And heaven forbid you attempt it after a huge, fulfilling meal. Thanks to portable devices like your iPhone or iPod Touch, you can now gracefully allow your grey matter to atrophy. Most people only need a standard calculator with basic functions, but even that is you, you should really consider picking up Shift’s Digits Calculator app. You will never need to access any other calculator again (unless you’re attempting higher math, like calculus). 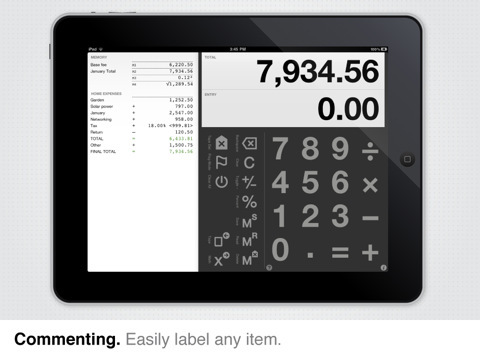 Upon launch, you’ll see a set-up just like any other calculator: a number pad with mathematical symbols on the bottom half of the screen with the results coming up at the top (while in portrait view). If some of the symbols at the bottom, however, are unfamiliar to you, just tap on the ? button at the bottom left corner to pull up the Guide; this button and the settings button on the right side are hidden in landscape view. The bottom half is split into two sides, with the left holding mostly functions. Besides the +/, %, and Clear buttons, another handy tool is the Flag button (I’ll explain in a bit). Don’t forget that you can slide the left functions panel open either way to reveal even more: tap the square outline with the left-pointing arrow to reveal administrative functions, or the X with the right-pointing arrow for more math symbols to utilize. The left subpanel allows you to email or print your “tape” (the strip of calculations), along with the ability to open up a completely new tape. Having multiple tapes on hand is awesome, but the true power of Digits Calculator is in the tape itself. Instead of being static–like a normal calculator–you can manipulate numbers even after you’d entered them. Just tap on a number or function on the tap, and a menu will pop up. Edit is one of the options, as well as Insert, Save in Memory, and Comment (another one of my favorites). In the Edit screen, just make your adjustments and the rest of the tape will be calculated accordingly. Comments is especially helpful for reminding you or what a number means, so if you’ve used Digits Calculator to split a bill, there will be no confusion as to what each number means; everything shows up if you decided to email a copy of the tape. Weirdly, you can’t see comments in landscape orientation, either. In fact, the only thing landscape has over portrait orientation is the fact that you can see more of the tape. If landscape didn’t have missing options, I’d probably use that more often for the sake of comfort, but portrait doesn’t give me any trouble. As for the Flag button, toggling it will flag every entry you tap subsequently; tap the Flag button again to toggle off and go back to using the Edit menu. The left subpanel has a Calculate Flags mode, which will actually make a grand total out of all the entries you tagged beforehand and the previous total. Unfortunately, the flagged entries cannot be transfered onto a new tape, which I would love to see happen. 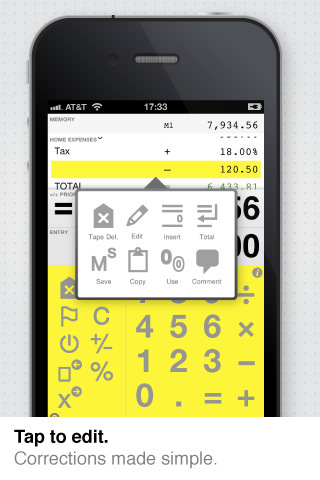 Digits Calculator is cleverly designed to look like cashier’s receipt (a neat addition might be to have cash register sound effects), and the number/function panels can be color-customized. Not that any of this matters, because the functionality of this app is practically through the roof. You can edit/correct calculations already made, and even start on new tapes–this kind of flexibility doesn’t happen everywhere, people. Embrace it when you come across it. Digits Calculator is easily the best calculator app I’ve had the pleasure to encounter so far, and is completely worth your $0.99. AppSafari review of Digits Calculator for iPad + iPhone was written by Julie Guan on March 18th, 2011 and categorized under App Store, Calculators, Featured, iPad apps, Productivity, Universal, Utilities. Page viewed 5116 times, 3 so far today. Need help on using these apps? Please read the Help Page.